***OPEN HOUSE SUNDAY 2/3 FROM 1-4PM*** IMMEDIATE OCCUPANCY AND READY TO MOVE into THIS BEAUTIFUL COLONIAL. 2 STORY FOYER, IN A VERY CONVENIENT AREA, FEATURING 4 BEDROOMS WITH 2.1 BATHROOMS WITH NEW GRANITE COUNTER-TOPS, MASTER W/BAY WINDOW SEAT AND TUB, HUGE KITCHEN AND NOOK AREA, OAK CABINETS. 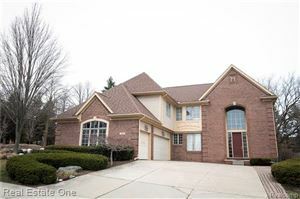 HIGH CEILING FAMILY ROOM, FORMAL LIVING ROOM, FULL FINISHED BASEMENT, REAR YARD W/BRICK PAVE PATIO OVERLOOKING ACRES OF WOODS AND WALKING TRAILS. JUST UPDATED NEW CARPET ALL OVER SECOND FLOOR AND NEW HARDWOOD FLOORING ALL FIRST FLOOR, BRAND NEW STOVE, DISHWASHER, MICROWAVE, NEWER REFRIGERATOR, NEW KITCHEN GRANITE, ROOF IS 5 YEARS OLD, HEATING 4 YEARS OLD, NEW GARBAGE DISPOSAL AND KITCHEN SINK-TOP, MOST OF THE HOUSE IS FRESHLY PAINTED. STONY CREEK PARK IS LESS THAN A MILE AWAY. PER BUILDER PROPERTY SQFT IS 2350.